Your Business Can Market AND Create Positive Change for Our Planet with Reusable Shopping Bags! Create a positive change for our planet while making a great impression on consumers by marketing with reusable shopping bags. There are a lot of great reasons why reusable bags make the perfect promotional tool. From their usefulness, to their environmental impact, factory pricing and the ability to completely customize are each on their own a compelling reason, but when you work with us at Factory Direct Promos, all of these reasons come into play. The reusable nature of our bags means that your customers can use your custom designed and branded bag again and again – possibly for several years. We pride ourselves on the materials and the construction, so our bags are durable and built for use. Each time your customers reach for your branded bag whether they realize it or not they will be reminded of your brand. Your message will resonate with them. 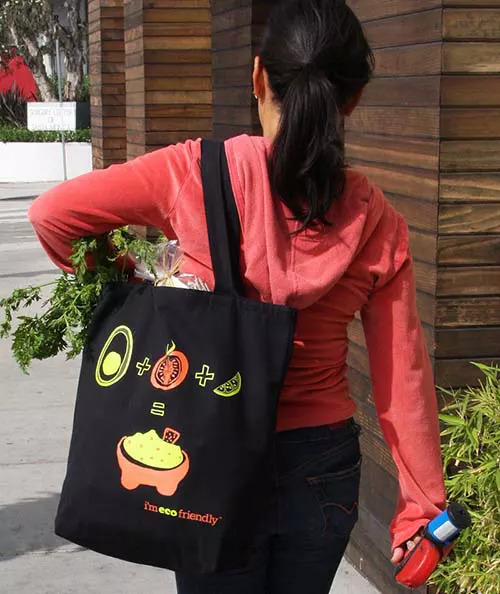 When your customers carry your customized reusable shopping bag, they will spread your branding message to everyone whose path they cross. Your customers will work like mobile billboards getting the word out about your brand. Over the course of several years this can add up to a lot of folks and gives your marketing message a serious reach. Single-use plastic bag bans are becoming more and more common; and for good reason. Disposable plastic bags cause too much environmental harm to warrant their continued use. Bans mean there is an increased demand for reusable bags, so this is a great way to give your customers something useful that they need, while also promoting your brand. Even in areas that do not have bag bans there is an increased use of reusable bags, as many people prefer to make this green change in their lives. Many stores are even giving customers a discount if they bring their own reusable bags, so you can promote your brand while saving your customers money on their grocery bill. Our reusable bags come in a variety of styles, colors and offer a wide array of features. You can choose from our in stock selection or create fully custom reusable shopping bags to fit your vision. You can add pockets, zippers, snaps, headphone ports and more. By customizing your bag, you are building function and usefulness into it. The more useful your customized bag is the more your customers will want to use it, and that means the more exposure your brand will receive. You can adjust the handle length or use different colored material for the gussets. Whatever you want to do we can help make it happen. Plastic bags carry a lot of baggage, but all the wrong kind. There are a lot of negative associations with plastic bags since they use up nonrenewable resources and cause some pretty serious environmental harm. Branding plastic bags can harm the planet and your business, since people will come to associate your company with flimsy, cheap bags that jeopardize the safety of animals and their habitats, take up space in landfills or are likely to become litter and be an eyesore. Choosing to market with reusable bags allows you to avoid all of these pitfalls while also giving you the value of a well-made, reusable product. Reusable shopping bags make a statement about your brand’s commitment to the planet and they show your customers that you value them. Custom bags let you build value into the bag and make it a useful tool. They also stretch your marketing budget and give you a great return on your investment. Are you interested in a quote or want to learn more about the design or ordering process? Email us at support@factorydirectpromos.com or give us a call at 1-866-222-0949. Our team can answer your questions and get you on your way to creating a customized reusable bag that will do the heavy lifting when it comes to promoting your business.